Gianni’s has outstanding pizza, hands down. Just because they don’t have a web site or because they’re located in the same strip mall as a shooting range and a few other shady looking places doesn’t mean that this take-out joint can’t crank out some mean pies. On their single page menu they promise “great taste, great food” and they’ve yet to let me down. Located just north of Fort Meade in Severn,** they don’t deliver. Nor do they offer a lot in the way of seating. Yet they’ve remained in business for a long time, pulling from the military families on base and the surrounding community. Most independent pizza places around here don’t last at all even if they do deliver, yet Gianni’s has got people leaving their houses and jobs to come pick the food up. That says something to me. Their traditional pizzas are big and have got a nice doughy crust. Soft edges and slightly crispy bottom. Plenty of herb-infused sauce meets a (non-)healthy amount of melted mozzarella, in an experience that really can’t be described easily. The last pie I got was a sixteen inch beast loaded with sweet sausage, onions, and green peppers ($15). Like an Italian-style philly but on pie crust, it was delicious. They also have the Godfather ($17) that includes extra cheese, pepperoni, sausage, banana peppers, green peppers, onions, and mushrooms. A large cheese will run you $11, by comparison. They offer Chicago style pizzas too. A buck more than a regular cheese for the small, two more for the large. The last time I had Chicago style pizza was in Chicago O’Hare airport about 15 years ago. I can still remember it, so until I head back to the windy city to visit a friend of mine I’m going to have to try Gianni’s version. They’ve got an antipasto salad ($4.50) that includes a fair bit of iceburg and green leaf lettuce, tossed with ham, salami, sliced cheese, and an amazing vinaigrette dressing. I think the price is a bit steep for what’s essentially a salad, but I can’t argue with the dressing. I wonder if they’d sell me a quart so I could use it at home. Gianni’s offers a decent assortment of subs (pizza, cosmo, ham & cheese, cold cut, meatball, gyro, cheese streak, turkey, chicken steak), the majority costing $5.50. They also do lasagna, manicotti, or stuffed shell dinners for $6.50. Not sure if they’re any good, but if they’re anywhere near as good as the pizza I’m sure they’re well worth it. They may be out of the way, but they’re definitely worth a visit. ** Technically the place is located in Severn, though depending on what online resource you consult they could be listed as being in Odenton or Elkridge as well. There’s only one, just don’t confuse their street address with the same addresses located in Bowie, since they’re nowhere near each other. 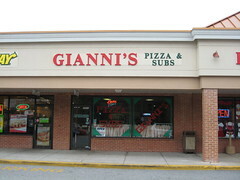 Whether or not there’s a business as that address in Bowie, it’s most certainly not Gianni’s Pizza. Mmmmmmm Giannis. Now I want pizza. Again. Delish! Oh man, I miss going to Gianni’s so much! I used to work near there for several years, and made the trip at least once a month for their meatball sub. Nobody, I mean NOBODY comes close to that toasted, smothered in mozzarella package of heaven! I might just have to drive out this weekend before the game & get one of those.